Boston, Cambridge, Portugal, Azores, Spain. . . Besides being places where I’ve lived and visited one of the things that ties them all together is my memory of piri piri shrimp – those ocean sweet shrimp, marinated in a spicy pepper sauce, then grilled to succulent perfection. We can thank the Portuguese explorers for introducing not only spices, but also these incendiary little relatives of the Tabasco chili to the world. A bottle of piri piri sauce, sometimes made with a secret family recipe, was a permanent offering on the tables of the little Portuguese restaurants in my old Cambridge neighborhood where I quickly became hooked on this dish. Tapas restaurants in Boston and neighboring towns offered all sorts of dishes splashed, grilled and marinated with piri piri sauce. Travelling through Spain I sampled many tapas offerings, but none as satisfying as piri piri shrimp. I was among the people packed in open air churrascarias (barbecue restaurants) in Portugal and in the Azores enjoying lip smacking shrimp, chicken, pork, beef and sausages, grilled in piri piri sauce. Yeah, I’m hooked. So it’s delightful when you discover a kindred spirit and out of the blue on one visit, he decides to grill up some piri piri shrimp! 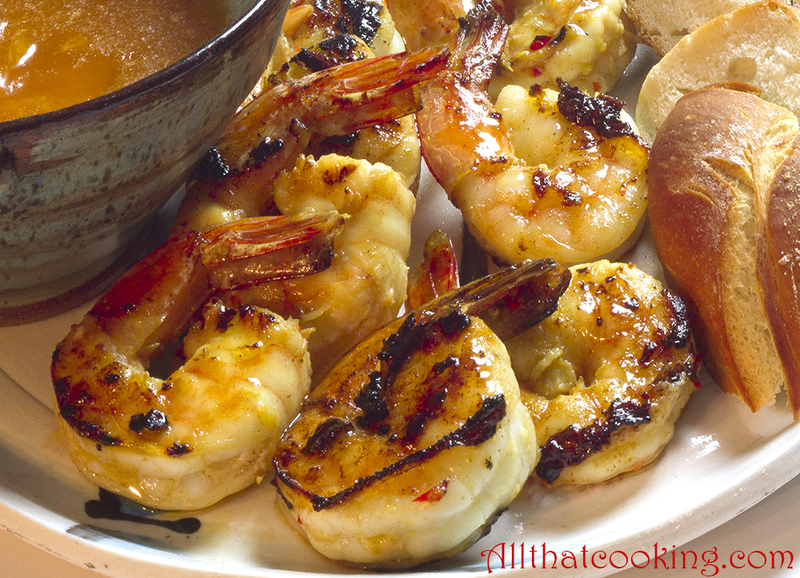 Oli makes a piri piri shrimp worthy of any churrascaria! With Labor Day fast approaching here’s Oli’s offering for the perfect, labor free barbecue fare to toss on your grill. I bet you’ll be hooked. Serve with reserved piri piri sauce, lemon or lime wedges and crusty bread to sop up the sauce. 1. Combine butter and olive oil in a small sauce pan. Cook over medium heat until butter melts. Stir in paprika, chilies, garlic, lime juice and salt. Bring to a boil then take off the heat. 2. When the sauce has reached room temperature add the shrimp, gently mixing to coat. 3. Marinate at room temperature for at least an hour. 3. Drain the shrimp over a small bowl and reserve sauce. Bring sauce to boil and boil for 1 minute. (Since the sauce contained raw shrimp, we want to kill any bacteria that might be lurking.) Remove from heat and keep warm. 4. Thread shrimp on a skewer and grill to perfection over high heat. We suggest cracking a frosty cold one to accompany this luscious shrimp. Enjoy your Labor Day weekend. Gallery | This entry was posted in Appetizers, Grilling, Starter and tagged grilled shrimp, labor free barbecued shrimp, piri piri sauce, piri piri shrimp, Portuguese grilled shrimp, tapas. Bookmark the permalink. The shrimp look so succulent! So yum and irresistible! And it’s so easy to make. Ideal for a relaxing barbecue. You had me at shrimp.